BNP Paribas Wealth Management Chatbot acts as a financial assistant, constantly updating users with the latest stock and company news. This bot is targeted towards busy individuals and investors that want a fast, easy way to track specific stock prices. 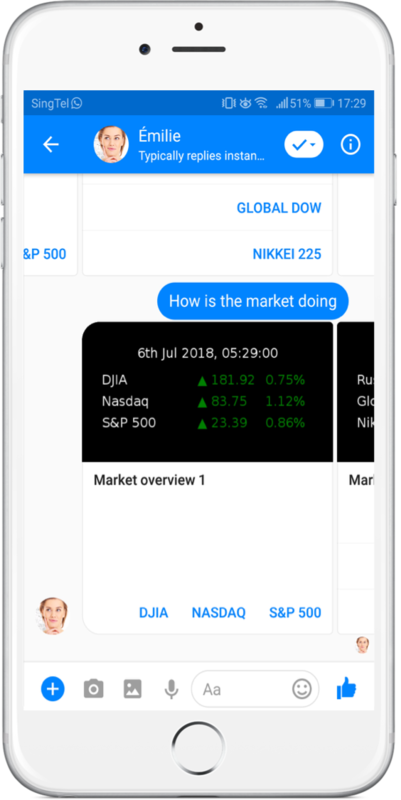 Instead of researching online or reading lengthy news articles, save time by directly asking the bot for real time updates on a stock’s status as well a general overview of the market. Relays latest information regarding a particular stock; answer FAQs on stocks and gives updates on company news. Enables customers to strategically plan and study market trends. Able to place limit, push/short options, and market buy/sell orders in real time. Provides professional advice on customer investment portfolios. Follows price movements and gives users access to trends they’re interested in. 24/7 and infinitely scalable; increases efficiency by allowing users to follow the stock market by asking the bot for updates. With the user's dates, duration and destination of travel, our intelligent Travel Insurance chatbot is able to pull up your various plans and compare their benefits and prices easily for the user. By making payment through the chatbot, purchasing travel insurance can't be any easier for your customers.